PORTSMOUTH – Cathartes Private Investments is planning to build a five-story hotel next to 3S Artspace on Vaughan Street in the city’s booming North End. The project also includes a proposal to create and then deed over to the city of Portsmouth a nearly one-acre waterfront park that would connect the North Mill Pond to the North End, according to Paul Young, spokesman for Jeff Johnston, the principal of Cathartes. Young estimated the new development, which will be built at 299 Vaughan St., will be a $20 million project, that will also include a restaurant and perhaps some retail or commercial spaces on the ground floor. The project is being proposed by the developers of the mixed-use Portwalk downtown development. 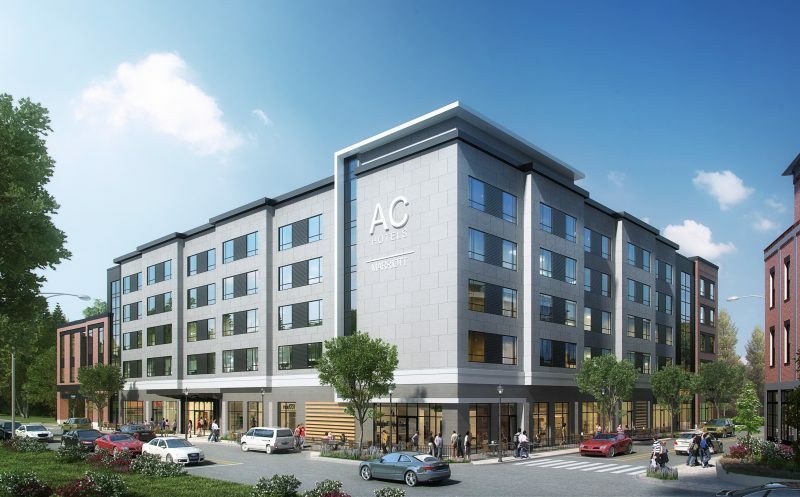 The proposed five-story hotel will be an AC Hotel by Marriott, Young said. “It’s a unique hotel, it’s very coveted to get one of those things,” Young said Tuesday. “They already have three in the downtown area,” Young said. The proposed hotel will feature 145 rooms, Young said, and stressed the project is in its early design phase. A key part of the project is the waterfront park, which will feature about 800 feet of water frontage and address important parts of the city’s North End Vision Plan and the 2025 Draft Master plan, Young said. “It is designed to attract young adults, entrepreneurs and others, which will be great for 3S Artspace and will benefit the city as a whole economically,” he said. Johnston serves on the board of the 3S Artspace and Young said the developer is “looking to partner with” 3S Artspace to “do something with local artists” at the new hotel. The proposed hotel’s footprint is larger than allowed under the zoning, but by creating the waterfront park, the developer can build on a bigger footprint, Young said. Cathartes could have benefited from the incentive to create a public open space by giving “less than a third” of the proposed waterfront park to the city, Young said. Developers are scheduled to appear before the Planning Board Jan. 19 for a preliminary review of the project. They also hope to begin appearing before the city’s Historic District Commission in February, Young said. “I think the hope is that it won’t be a long drawn-out process because it’s a fairly straight-forward development project,” Young said of the upcoming review by city land-use boards. “I think it’s reasonable to get through the whole thing fairly quickly and hopefully get it under construction sometime this year,” Young said.